Linda Burton posting from Salem, Oregon – The buses brought the kids today. Three loads of them were sitting on the capitol steps as I approached; the girls were singing in a chant “Elvis Presley, girls are messy,” hands clapping on the beat. 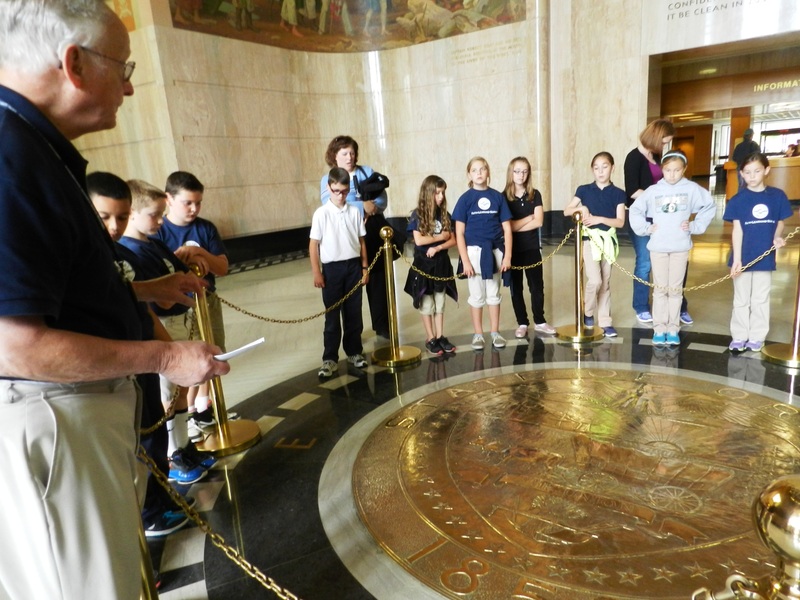 I pushed through the revolving door of the Oregon state capitol and found myself in the rotunda just as a group of students approached the center, taking their place around the seal embedded in the floor. The tour guide stepped beside me, “You’re welcome to join us,” he said and so I stayed, intent on hearing the story of the seal. It shines like gold, but the guide explained that it was brass. He pointed to the elk, the sheaf, the plow, the axe. He talked about the covered ox-drawn wagon, symbolizing the pioneers that came to Oregon. Then he pointed to the ships – one coming towards land, the other sailing away. “One is an American ship,” he said, “and one is British. Do you know why the British ship is going away?” The children waited expectantly for the next line. “It was all about land,” he continued. “Do you know who won the first war we had with Britain?” A young man wearing a white dress shirt raised his hand. “We did,” he offered. “And who won the War of 1812?” The same young man answered, “We did.” “Was there another war?” the guide asked, looking around the circle. The children waited, not quite sure. 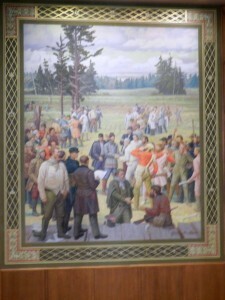 The guide explained the land dispute, extending his hands to indicate the size of the territory at stake. “All the way from the Artic to the south of here,” he said, “but there was an agreement, finally; Britain got all the land north of the 49th parallel, the United States got the land to the south. There was no war. That’s why the British ship is sailing away.” The children nodded. 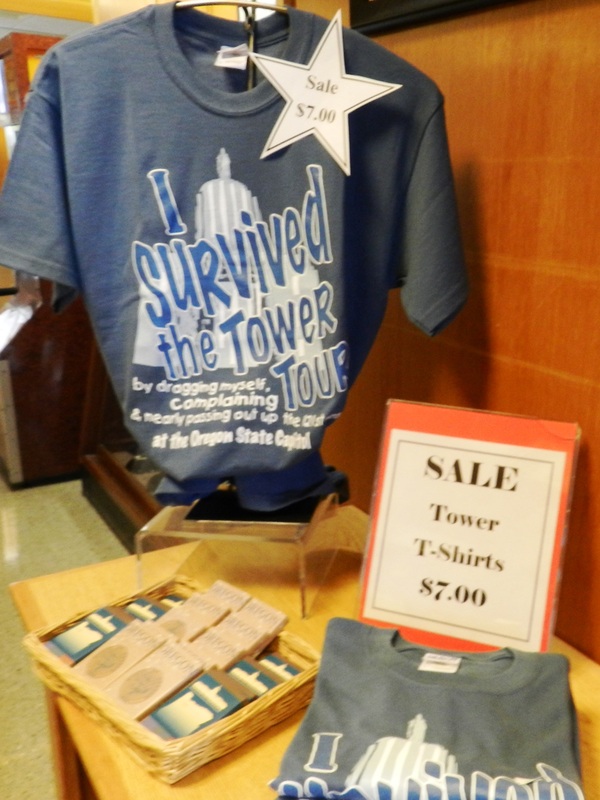 I left the group, ready to continue my personal tour of this historic building. I walked across the building to the House Gallery, where another school group sat attentively, as the guide pointed out the mural behind the Speaker’s desk. 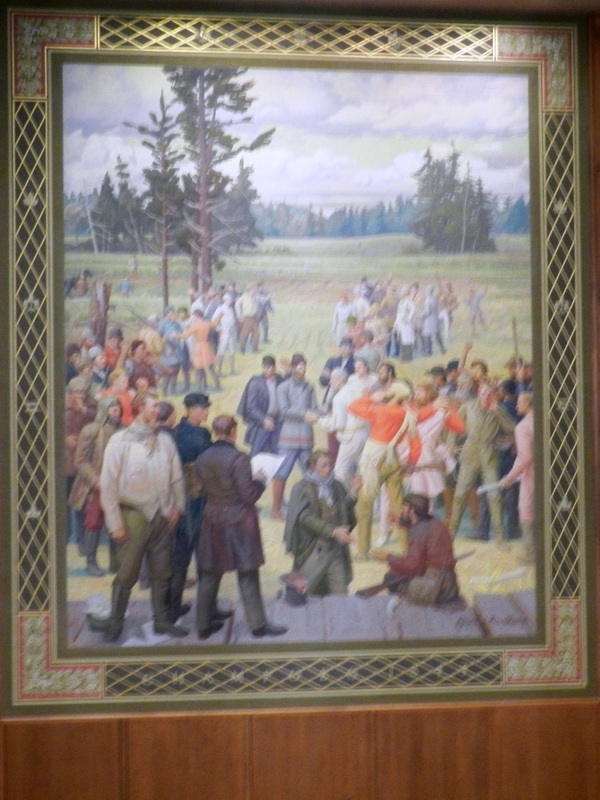 “This shows the Oregon pioneers at Champoeg in 1843,” he said, “when the provisional government was established.” He went on to point out the Douglas Fir on the carpet design; it’s the state tree. 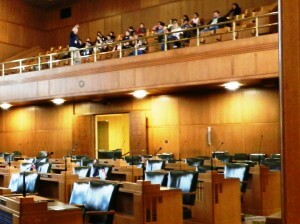 In the Governor’s reception area, on the second floor, I came upon yet another school group, standing on one side of the room. “What kind of work do people in here do?” asked the guide. There was silence. “Well, do they make hamburgers?” The children giggled, just a bit. “No, they make laws,” answered one of the girls in the group. Well, that was that. The Governor’s door was closed, “He’s in a meeting now,” I was told. His ceremonial office was closed as well, something going on in there. I bought some postcards and headed back outside. The yellow buses waited at the curb. I’m thinking there’ll be singing on the ride back home; and lots of talking too. The Tower Tour! I thought I’d die!